It's been a while since I've felt confident enough to post an outfit photo but today I'm feeling pretty good about the way I look and especially in this outfit. And despite the fact that I'm actually ill at the moment and covering it up with makeup as much as possible, I decided to take some outfit photos for the first time in a month and non-collaboratively since January. Carry on reading to find out more about why I've become more confident and of course about this outfit and why I love it. Okay, so what made me take these photos today? Well first of all my new high-waist jeans are pretty awesome with the button fastening and belt loops. I love the belt loops because like here, I can add some belts to spruce up a simple look. 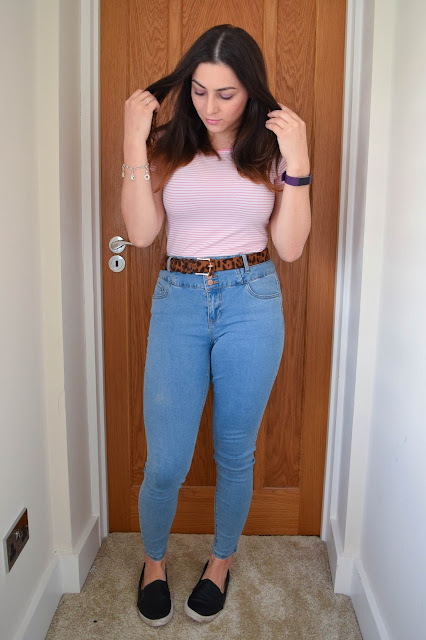 If you've followed my blog for a while you know I love a bit of a print clash so of course I had to go for a leopard print style belt to clash with my stripes. I love a clean pair of jeans without the rips at the moment too. They work well for all occasions and of course I got them in a classic light blue for more versatility in my outfits. As well as the jeans these tees from Primark are my absolute must-have essentials in my wardrobe now. Forget any other brands, these are soft, comfortable, they suit my shape and fit so well. I bought a couple of these tees back in December in black, white and then monochrome striped but I had to add a couple more in my collection and this is just one of 3 more that I bought. I also bought some of Primark's strap vests which are quickly becoming a summer must-have in my wardrobe too but I'm sure you'll be seeing a couple of those styled up in some upcoming holiday style posts I'm hoping to get up. I love a simple jeans and a tee look, especially at the weekend. 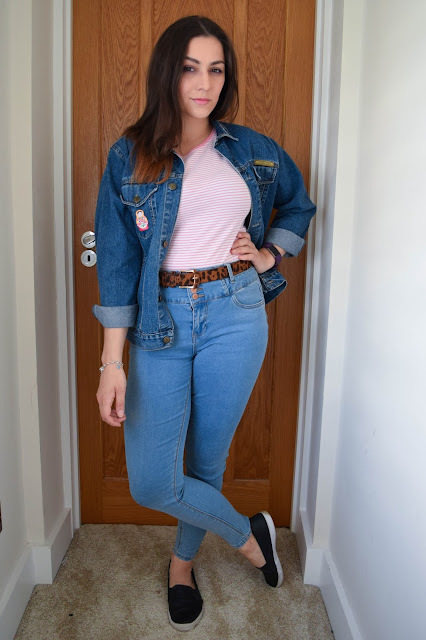 It's my go-to outfit and I love pairing it with my vintage denim jacket passed down from my mum. 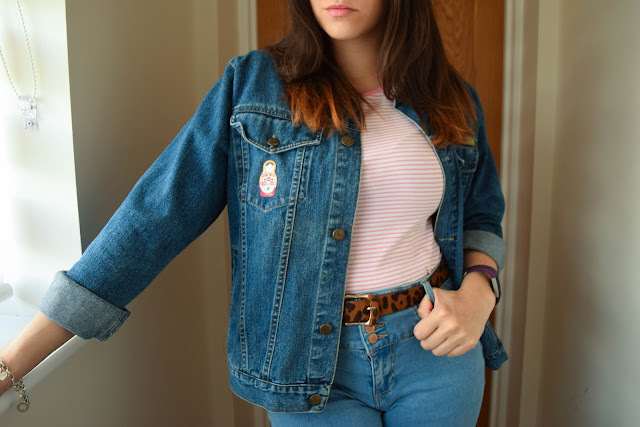 You might have seen on Instagram that my bestie Ana has a similar look going on with her denim jacket patches and it's because we split a couple of patch packs from Hobbycraft to have matching patches and jackets! 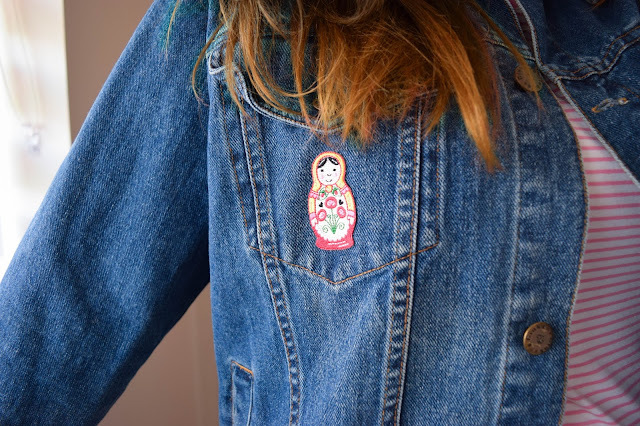 Now we're on a mission to patch up our denim jackets even more. 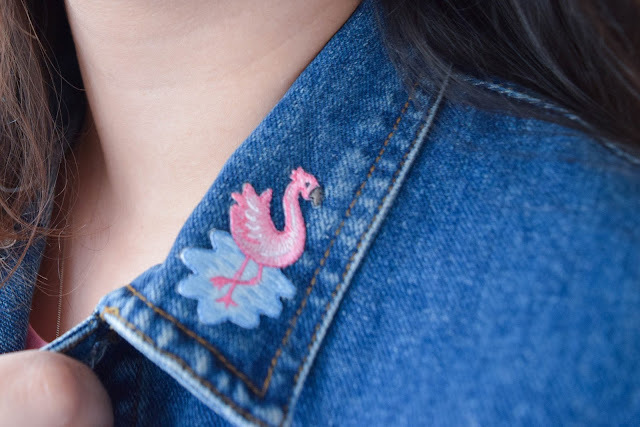 The flamingo is just a must and totally adorable. We both put them on our collars and then we have the Russian dolls on our opposite pockets. Though Russian we felt they were pretty Portuguese so it was a must too! As I mentioned before I've had a little confidence boost since I last posted an outfit and since beginning my fitness regime for the last month and a half and doing it consistently week in and week out I feel like I have taken a huge step in the right direction. It's been a boost of confidence because my mind set is now in the right place and I'm doing something about how I feel and working towards my goals consistently. I also accepted that I have moved up a dress size and purposely went out to buy a pair of jeans that I would be happy and comfortable in. Thus, my new jeans. I know now that I had this ridiculous stigma about not being the size I've been for the last 10 years anymore but I've learned to accept it and embrace it. I know there's nothing wrong with fluctuating between sizes or being a new size but it's new territory for me so it was hard to understand. It has taken me a long, long time to accept and understand this but now I have, I am 100 times happier now. This is definitely a fave look and definitely my fave new pair of jeans. You'll be seeing this a lot from now on. I also love these photos and for the first time in a long time, how I look in them. Yeah! I said it! #SELFLOVE. You look amazing, those jeans fit beautifully AND the buttons and hoops bit remind me of Portuguese jeans so much! I love the jacket too, the double denim look! I can not wait to see you again already! Beautiful outfit and beautiful girl!